A Shared office is a step up from the virtual office space package, and allows a company to have the features of an Executive office without the expense. Especially when they do not need the use of that office on a full time basis. You get the non exclusive use of an executive office, with the benefit of a private office and prestigous address. What does a full time shared office include? More than 50 distinct support services are available. You decide … do you want a virtual office or a part time shared office? 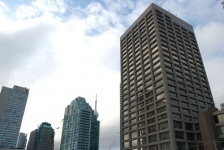 When measuring your Toronto office space, try to discount 18 inches per measurement. How will gift card sales affect your business in January?